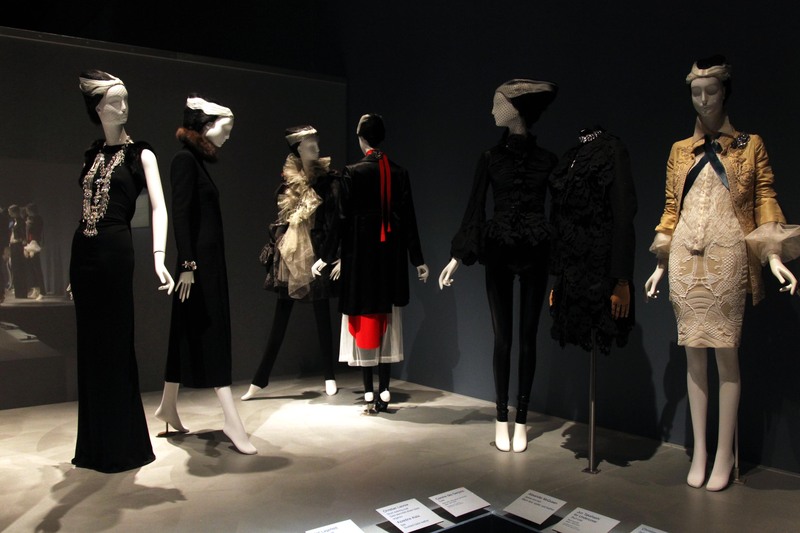 If you are a lover of fashion, a student of fashion – or just plain curious about beautiful things, you must make your way to the Museum at FIT in NYC, before January 7th. 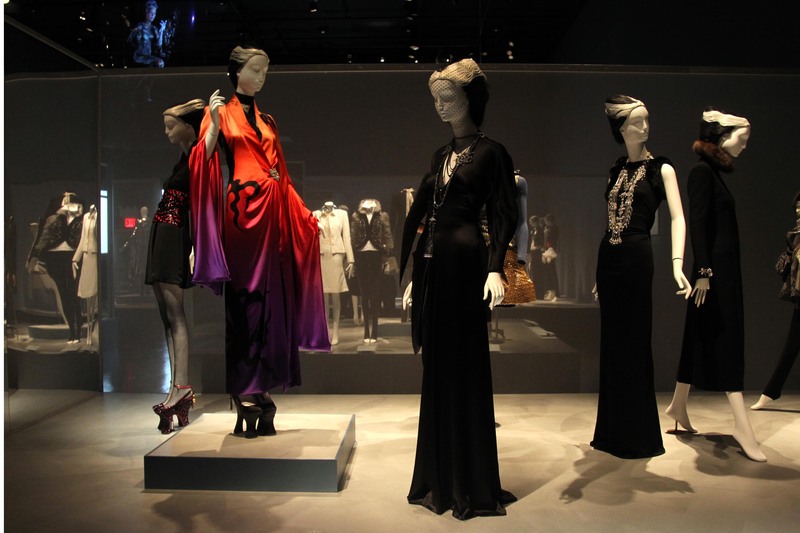 That’s when the Daphne Guinness exhibition currently being shown at the Museum, takes a final bow. I took in the exhibition and attended the Fashion Icons & Insiders Symposium hosted by FIT back in November and have been sharing my thoughts on both. Yesterday, in part one, I wrote about three of the themes the exhibition is curated around – Armor, Evening Chic and Sparkle. In today’s post, I’ll cover the remaining three. One thing we can never accuse Ms. Guinness of being, is boring. The next grouping of clothes in the show, were proof positive that the woman isn’t beige. “Fashion today is becoming more beige. almost like a Mao uniform. What I call drama was labelled Exoticism in the show, and included (more) kimono sleeves, a Lagerfeld fur-trimmed coat, a Rick Owens coat (worn backwards), with a tangled mélange of metal worn as a necklace, in front. I’ve never been into the whole skull thing that everyone does – but this dress? This dress is a need. There was also a need to hold on to the wall behind me – as I took in the Jun Takahashi for Undercover skull dress – made from layers of felt skull cut-outs. The statement above says so much about the exhibit as a whole. While the pieces throughout are collectible, Daphne is not precious about wearing them out – and that includes looking Chic in daylight hours, too. Whether it’s Chanel bell sleeves, a simple (ha!) black, Chanel suit, Alaïa eyelets or Pugh’s pointed shoulders – it’s all dandy for day or night. 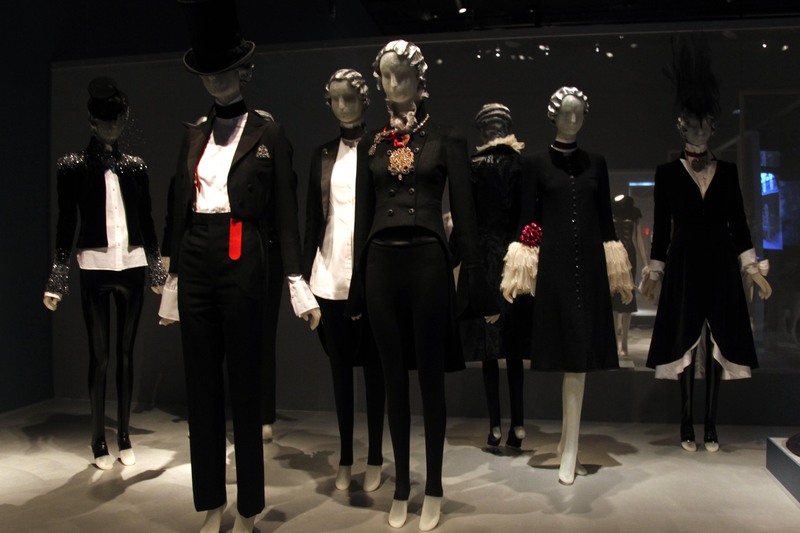 And it’s all Dandy in black and white, too – the last of the themes in the show. You will nod your head as you walk through – ah yes, the black and white tailored details you see on Daphne so often. She and I are kindred spirits in many ways – I have never met a black jacket and white shirt ensemble I didn’t love. Guinness has “an absolute passion for men’s clothes” and credits her “love of literature – Oscar Wilde, Proust” for it. “Plus, I didn’t get to go to Eton! I’ve always liked men’s tailoring. I am obsessed with architecture in all its forms and the human body in space. The way a jacket is constructed is in architecture. I like the idea of being androgynous, of being able to be in a suit,” she told an intimate gathering of fashion insiders, attending the Symposium. Here, one gasps over McQueen’s tail coat – to choose it or Dior’s tail coat? Daphne got them both! 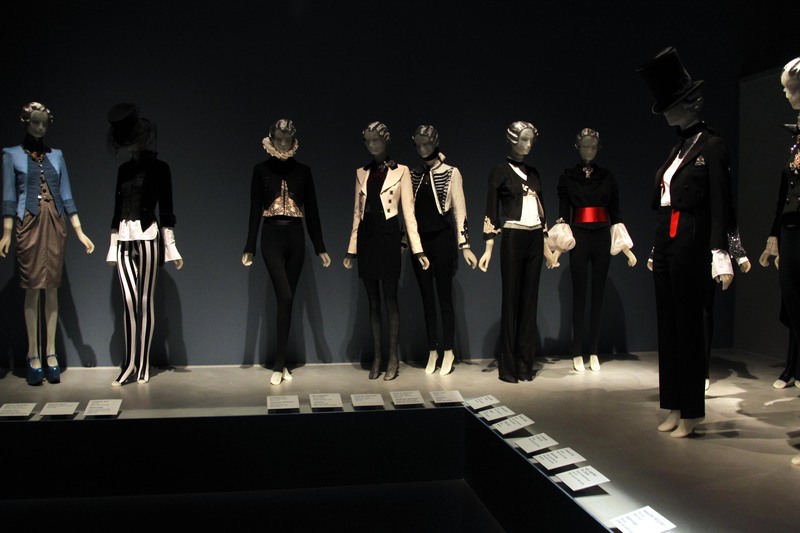 There is also a Dior military bolero jacket and a McQueen ruffled vest with Indian embroidery and a Huntsman & Sons tuxedo. And then there is the Lacroix indigo evening dress, worn with a weighty cape of McQueen’s silver eagles, perched upon the shoulders. Very Poe-etic. There is poetry throughout the show, really. It is in the jewels worn in unusual places – a brooch on an inner sleeve, a back-draped pendant. It is in the trailing ribbons. It is spoken in the contrasts of chiffon and metal and in the armor and romantic gowns one needs to conquer modern-day reality. There is depth to this show and one realizes it in so many such details. This is more than just clothes in a room, more than just clothes taken out of someone’s closet. Each accessory, each piece tells us something about the woman who owns them – you can see her love of philosophy, of history, of poetry, of art, here. It is in the strategic acquisition of these key pieces that were made by designers big and small, from the right collections from these designers. And I mean strategic not in a business-y way as to acquire things that would appreciate in value. These pieces were bought for love – and Daphne’s eye is flawless in that regard. She has curated this collection well before the seed of the idea to host it in a museum was planted in anyone’s mind. She is a natural curator. She is flawless in person. This collection of clothes will take the breath from your lungs, the words from your lips, and leave you with a longing – not just for these beautiful things – but for the heart, the soul, the spirit, the intangible, infallible love behind them. There is love in the way these pieces were designed, in the way they were made, worn and displayed. That is what I left the room with – an overwhelming feeling of love. If there were ever a doubt that fashion is art, it was put to rest in a bed of feathers and beads. Get thee to the corner of 7th and West 27th before it goes back inside Daphne’s New York and London closets! Quotes in blue are taken directly from the exhibition. All others are from my notes at the Fashion Icons & Insiders Symposium. Images: All photos, as credited. 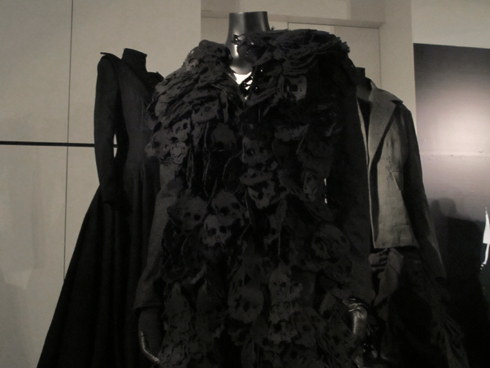 Skull dress on display at the 2010 MoMu exhibit (in Belgium) entitled Masters of Black in Fashion & Costume image from http://www.stylezeitgeist.com. Jimi Celeste photos are © Patrick McMullan, and provided courtesy of FIT. All others are by yours truly – please be kind enough to provide credit and link back if you are using them on your site. Thanks. Next Post Fashion Archives: Arrrrgh!